If it's bright, and colourful, it's perfect for me to paint. If it leads somewhere else, be a river or a backalley, it's for me to explore. I will give it movement and shadows, I will play with the forms and the colours until I like it and I have shared my first impression. Acrylic paint for its bright colours and flexibility. I can't stand waiting for paint to dry so acrylic is perfect. Canvases and hard boards work for me, from large enough format you feel like entering the painting to small lively rendition to inspire a little. Most of my work is about what I like to see on canvas but every so often I will paint what you would like to see. So I do commission work. Just ask me. I am participating in a group show "Conversation of beauty"at the Leir House in Penticton from April 12 to May2, 2019. All welcome! I have just installed 6 large paintings at the Kelowna Community Theatre as part of Artscape organized by the Art Council of the Central Okanagan. Thanks to Heather Yip, the curator, I think it looks great! The FCA juried exhibition in Osoyoos "On the wall" was a success! I had the honor to receive second prize for my painting "On a whim" and sold a painting. Thank you to the buyer and everyone who visited the show ! Would you like to have fun and learn to paint like me? I will be offering a second 2 sessions workshop at Front Street Gallery later this spring of 2019 . Please contact the gallery or send me a direct email to register! A big welcome to Elizabeth Bigg, Penticton's new animal control officer. 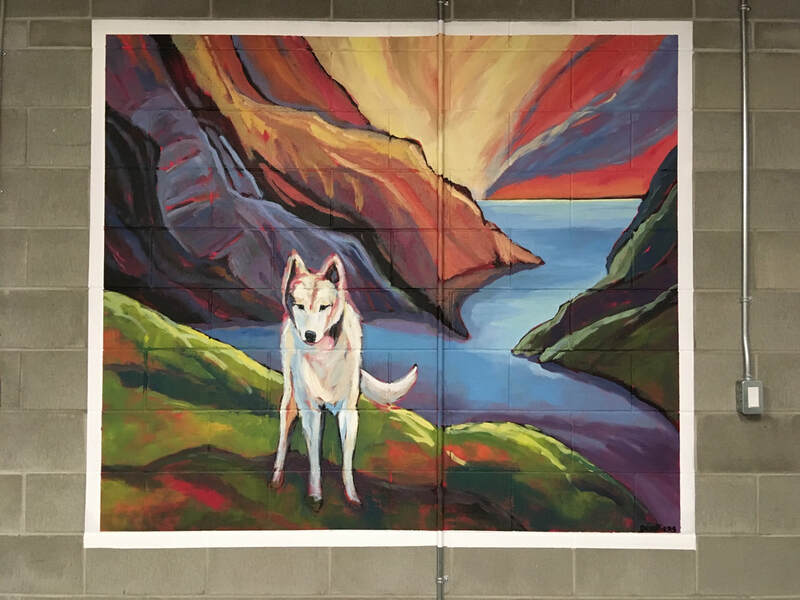 And see below the two murals she so easily convinced me to paint for free to continue her Penticton Dog pound beautification project. The murals are approx. 6 to 8 feet wide by 5 feet tall and painted with commercial paint kindly donated by True colours, Benjamin Moore paint store in Penticton. Another mural painted by Barb Hoffer is also on display. ​ If you are in Penticton and looking to see some of my new works, both the Front Street Gallery located at 60 Front Street and The Tumbleweed Gallery located at 452 Main Street carry my work. I may be found in either one of the galleries working on a new painting on any given day. Please contact me to find out when and where.